105 by 81 in. 266.7 by 205.7 cm. Courtesy of the artist; Peres Projects, Berlin; and Mitchell-Innes & Nash, NY. 107 by 82 in. 271.8 by 208.3 cm. 106 by 82 in. 269.2 by 208.3 cm. 107 by 84 in. 271.8 by 213.4 cm. 71 by 74 in. 180.3 by 188 cm. 105 by 71 in. 266.7 by 180.3 cm. NEW YORK, NY, March 26, 2015 - Mitchell-Innes & Nash is delighted to announce a solo exhibition of 8 new woven paintings by Canadian-born artist, Brent Wadden. This will be the first exhibition with the artist since he joined the gallery in 2014 and his first major solo exhibition in New York City. The exhibition will be on view from April 23 to May 30, 2015. Please join us for an opening reception in the gallery on Thursday, April 23 from 6 to 8 pm. Known for his woven paintings—made of handwoven fibers, wool, cotton, and acrylic on canvas—Wadden’s work often disrupts traditional divisions between folk art and fine art. His abstract works complicate the painterly notion of surface, while reconsidering the concept of the handmade. In a labor-intensive process, Wadden works on a floor loom, weaving yarn and wool into geometric, abstract designs. He then stitches together these woven panels mounts the finished work on raw canvas to create visually jagged, geometric constructions. Conscious of the tone, density, and tension of his materials and practice, the artist’s focus on form seeks to reinterpret traditional gender roles in art-making and craftsmanship. Wadden’s paintings reference both a structural life and planar presence, which further seek to rework ideas of space and mark-making. Brent Wadden (b. 1979, Nova Scotia, Canada) lives and works between Vancouver, Canada and Berlin, Germany. He received his B.F.A. from Nova Scotia College of Art and Design in 2003. His work has been shown in recent international group exhibitions such as Mingei: Are You Here?, Pace Gallery, New York (2014); Abstract America Today, Saatchi Gallery, London (2014); Frauen, die Asstellung, curated by Elena Brugnano and Lena Ispen at Autocenter, Berlin (2014); WITH SMALL WORDS, Kunsthalle Exnergasse, Vienna (2014). He has presented solo shows at Peres Projects, Berlin (2015), Almine Rech Gallery, Brussels (2014) and Sorry We’re Closed, Brussels (2013). 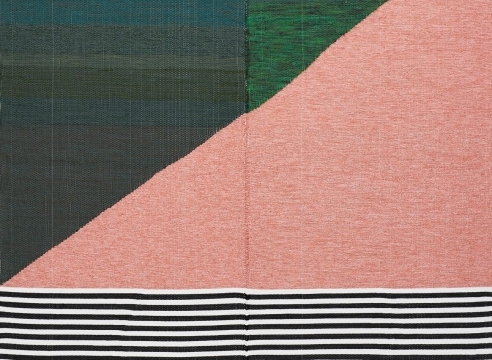 Stand inches away from a Brent Wadden canvas and the work takes on a similar monumentality to a Clyfford Still painting. The edge of a given shape seems to drop into a bottomless void. A few steps back, however, with the canvas in full view, these shapes form a pattern—those canyons are now part of a flat surface without depth. From this distance the eye skates from swatch to swatch, absorbing the variation in surface color and texture. All of the eight works on view oscillate, at times assuming the flat surface of a geometric design, at others, the depth of a landscape. See the excellent first show by Brent Wadden, a young Canadian-born painter who has set aside his brushes and taken up weaving, making thick rug-like abstractions whose jagged, interlocking shapes have the wobble of Op Art except softened by vagaries of color, texture and edge. The work resonates with the history of textiles and meets halfway the efforts of textile artists like Anni Albers and Sheila Hicks, who broached painting from the other side. The Canadian artist just joined the Mitchell-Innes & Nash roster last year, and for his first show with the gallery—and his first solo show in New York—he’s putting up eight of his woven paintings.